On May 30th, 2016, we lost our precious son Bertram to NGLY1 deficiency. As you can imagine, our world fell apart. But in the midst of grief, our own lives took on a new purpose. At first, we did not recognize it, and to be honest we still have not fully grasped it. … but we have found hope. Viktor was born in 2004. I had just moved in with Henriette and we were eagerly anticipating adding to our family, which included my stepson Fredrik and our two cats. However, the last planned visit with our midwife turned our joy into anxiousness. Scans showed that Viktor was too small and that his life signs were too weak. A few days later, on June 4th, 8 weeks ahead of schedule, Viktor was born following an emergency C-section. Premature and too small for his age (weighing only 1,235 grams= 2.72 pounds), Viktor would spend his first two months hospitalized to build strength. Discharged in good health, it soon became clear that Viktor did not develop the way he was supposed to. He couldn’t hold his head, grab things or crawl, and he began having seizure-like tremors. After 18 months Viktor was found to have suffered brain damage during birth, and was diagnosed with Cerebral Palsy caused by hypoxia. Viktor grew and while he showed improvements it became more and more clear that Viktor would not live an ordinary life. He was both mentally and physically underdeveloped and showed extreme hyperacusis and tactile hypersensitivity making it difficult to take him anywhere. We became isolated, but found our routine. If we stayed within the perimeter of Viktor’s comfort zone he was a happy boy thoroughly enjoying himself, so we just settled for a different life. Then in 2011 we had Bertram. Contrary to Viktor, Bertram showed strong life signs and stayed within the thresholds. Birth went well and for a while we relished the joy of having a sweet and healthy boy. … but only for a while. Within half a year Bertram began to display the same disabilities that Viktor had. Since Bertram had not suffered from hypoxia and did not show signs of brain damage, the search for a different culprit began. It took more than three years to finally discover that both he and Viktor suffered from NGLY1 deficiency. Getting the diagnosis was such a relief, even though it didn’t provide us with any promises for a cure or even treatment. But now we knew. Thanks to Bertram we got in touch with the NGLY1 community and found a new and caring family. More than that, we found champions who are dedicated to finding a cure, and for a few precious months we caught a glimpse of what could have been for Bertram. Born with pulmonary issues Bertram was frail to begin with and as he grew his seizures gradually became more frequent. As time passed he lost his strength and found it more and more difficult to deal with the multiple bacterial and viral infections that kept affecting him. 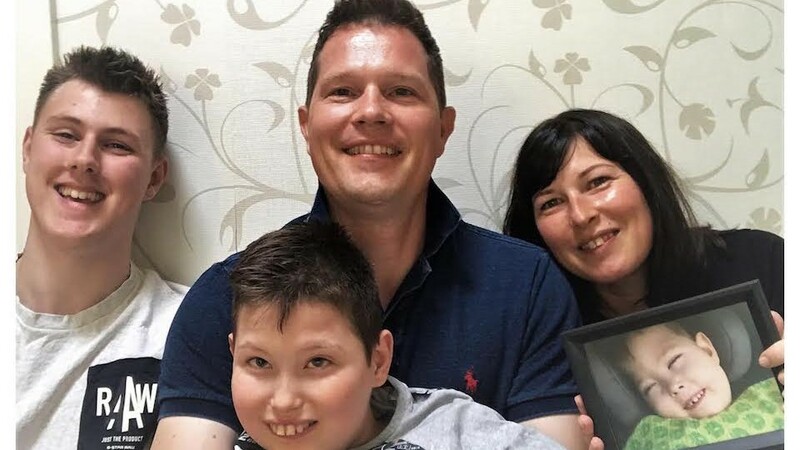 Less than a month after Viktor was diagnosed – and only three months after getting his own – Bertram gave in. He had had enough. He didn’t pull out of the fight before leaving a legacy, though. Without Bertram, we wouldn’t have known what Viktor is suffering from. Without Bertram, we wouldn’t have gotten in touch with the wonderful people in the NGLY1 community – the kids, their parents, the doctors, the scientist and all the volunteers. Thus, spurred on we will do anything to help Viktor and all other kids like him in their fight against NGLY1 deficiency. To help Grace Science Foundation and others dedicated to finding a cure. To help Matt and Kristen succeed. …and with a unique collaborative research setup driven and supported by tenacious, strong-willed parents and modern technological possibilities, we feel confident that Grace Science Foundation WILL succeed.